Quechua is a Native American language spoken by nearly 10 million people, primarily in the Andes region of South America. It is best known as the language of the ancient Inca empire. Alongside Spanish, Quechua is an official language in Bolivia, Ecuador and Peru. Ideal for anthropologists, students and travelers, this dictionary features over 11,000 entries as well as an introduction to the Quechua language and basics of grammar. 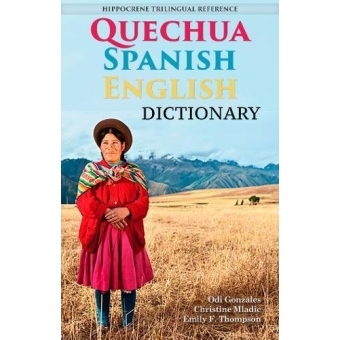 This unique full-length dictionary includes 3 sections: English-Quechua, Spanish-Quechua, and Quechua-Spanish-English. Spanish is a logical conduit language between Quechua and English, and many Quechua words are found in Peruvian Spanish. Odi Gonzales is a Quechua native speaker, researcher, translator and poet. He has published several scholarly books in the field of Latin American Literature and seven collections of poems. Since 2008 he has taught Quechua and Prehispanic courses as a lecturer at NYU.